At first, there was some confusion about our room, it seems that one room was undergoing repairs and there were more bookings than available rooms. We were told that we would have to move to another room after the first night, but would get a better room for free in return - no big deal so far. Then, during the night, we noticed that there was no warm water, and when calling the receptionist we were told that this is normal and we will have warm water again in the morning. By morning, we woke up to the noise of loud construction works, and there was still no warm water. This time, we were told that due to the construction works, there is no warm water in the entire hotel. Surprised that no one cared to tell us about the construction works when we checked in (the works started early in the morning, so they must have been scheduled ahead and known to the staff the previous evening), we decided we would not wait to see when the works would be finished (for the warm water as well as the noise) and left. Disappointed mainly from the lack of communication. Not really close to the center, but 5-10 mins by taxi. We got the the airport in 15mins (sunday morning), they were able to arrange a ride for 3000 soms. The hotel was clean, the staff spoke english. The breakfast was delicios. Only bad thing was that the floor must be old, and we could hear people walking in the room above us all night (dont know what were they doing).. They have a pool, but the water temperature was 15 degrees, so did not use it. Parasat Hotel is a convenient choice given the rate they offered. The rooms are small yet comfortable, the only downside was the washroom which was very tiny and the illumination was not sufficient. The breakfast is good, it costs the equivalent of 1 Euro and it was not included in the room rate. But it was good. The location is a 100 metres walk to the main street, which is not very encouraging during evenings. Parasat Hotel is situated not far from the public transport, has fairly good breakfast and some of the staff are willing to help. But the problems started from the check-in. The receptionist couldn't find our reservation, later the system showed different price, and simple check-in took around 25 minutes. The room is not big, enough for spending a night, hot shower, not impeccably clean. It was cold in the room, the internet was not working properly and later on - the blackout of half of the hotel happened. Associates tried to fix all the problems, the electricity appeared after one hour, internet issue was fixed, heater was provided. 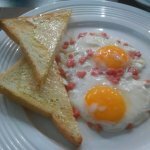 Breakfast is mixed: a la carte for main breakfast items and buffet with selection of cereals, milk and drinks. There is a restaurant in the hotel, but the prices can't be compared with the restaurants nearby. good wi fi and tasty real Korean kitchen with funny service !! !